Spanish colonial adobe bricks discovered at a dig site in downtown San Antonio's Alamo Plaza may have comprised part of the mission's original western wall, researchers announced Monday. 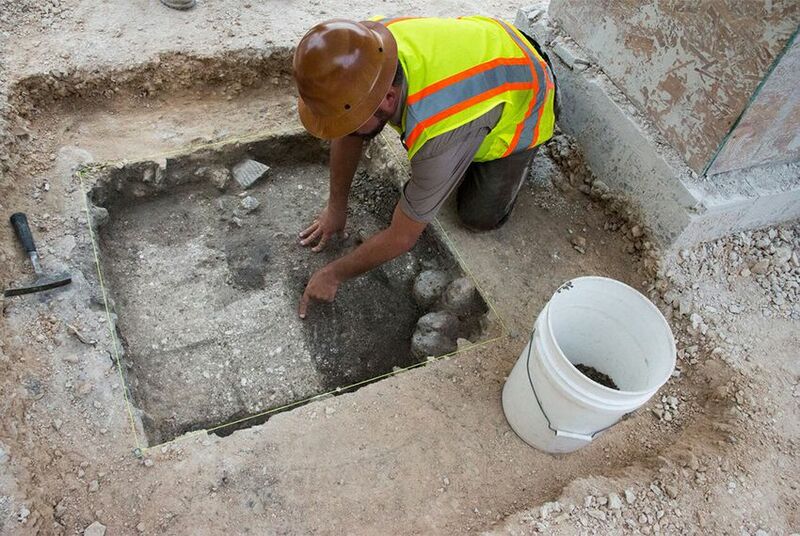 Texas archaeologists may have found more pieces of the Alamo. Spanish colonial adobe bricks discovered at a dig site in downtown San Antonio's Alamo Plaza may have made up part of the mission's original western wall, researchers announced Monday, although more analysis is needed to verify the architectural function of the centuries-old bricks. The dig, the first of its kind at the Alamo, is the first phase in a larger effort by state and local officials to renovate the historical landmark. Before construction plans can be drawn up, members of Reimagine the Alamo, the city of San Antonio and the Alamo Endowment are trying to learn as much as they can about the original 18th-century mission's architecture and location. Discovery of the bricks on Friday marked a major step toward uncovering the construction history of the world-famous Texas landmark. The bricks were discovered near the current mission's western wall, just 23 inches beneath the surface, Anderson said. They clearly form a larger wall structure, but years of wear and tear have left the fragile mud structures in very poor condition. In a news release, the officials in charge of the Alamo's refurbishing said they hoped to unearth the original western and southern walls. Friday, archaeologists may have done just that. But Anderson noted the bricks could simply be a part of a structure that was erected near the original mission. “All we know right now is that we’ve got wall,” she said. Land Commissioner George P. Bush, whose office oversees the Texas shrine, expressed excitement over the discovery. "This archeological exploration of the area surrounding the Alamo will be a tremendous benefit as we develop a master plan for reimagining the Alamo," Bush wrote in a release. "I am proud of the team of leading experts we have assembled to guide us through this historical process." Archaeologists will continue their dig for the next several weeks, updating the public on their findings with daily announcements.